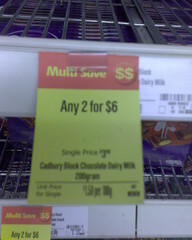 Noticed the label on the shelf in Coles exhorting the wonder that is ‘Multi Save‘ on 200g blocks of Cadbury chocolate. You can buy ‘Any 2 for $6‘. A wonderful saving at only $1.50 per 100g. Or you could just buy them individually for $3 each. A bit of false advertising then?